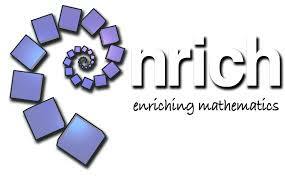 NRICH: Welcome to the Home of Rich Mathematics! When I think of things that are rich, I’m more likely to think of hot chocolate or creamy cheese sauce than mathematics, but clearly I’ve been missing out. One of my students sent me the website for NRICH—the home of rich mathematics and I was hooked. 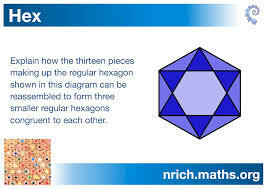 NRICH is associated with the University of Cambridge and is designed to “enrich the mathematical experiences of all learners.” It is full of opportunities for mathematical thinking, problem solving, and creativity in mathematics. Activities are divided by grade levels, with both British and U.S. levels indicated, with sites available for students and teachers. There are so many interesting things there it is hard to know where to start, but I’ll give you a sampling. The “Being Curious” area for lower primary children is full of activities to help young children wonder about mathematical questions. How many different heights of robot monsters can be made with three different heads, three bodies, and three sets of legs? 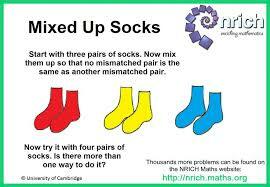 How many different mismatched pairs can be made with three pairs of socks? Four pairs? Mathematics is a creative subject. It involves spotting patterns, making connections, and finding new ways of looking at things. Creative mathematicians play with ideas, draw pictures, have the courage to experiment and ask good questions. It is full of interesting games and puzzles to explore. Of course there are also mathematical reasoning challenges for older students involving trigonometry and calculus. The teacher resources are full of math activities at various levels, as well as curriculum guides, curriculum mapping, and professional development resources geared to the National Curriculum in England. For those of us who lives elsewhere, it is a great opportunity for international exploration. If you teach math—or even if you just like math—NRICH if for you. It will help your students see math as more than computation and think about the world in mathematical ways. And what could be better for budding creative mathematicians?